Kippie in her new forever home in Florida! My husband and I would like to let you know how pleased we are with our new baby a male Havanese puppy whom we have named Dayspring’s Floki Butterscotch Rum. He is sweet smart and most of all very content and happy. We would like to let you know that the care and efforts of special raw diet have also helped our German Shepard dog who is suffering from numerous health problems. You have obviously raised these puppies with lots of love keeping them home grown and “Jersey Fresh” with your holistic and organic breeding, grooming, and feeding methods which are new to us. After having many different puppies over the years, we highly recommend you as a knowledgeable and professional breeder of the highest standards. The professionalism that you provided us with the paperwork for the AKC and the health records for Floki were very much appreciated by us. 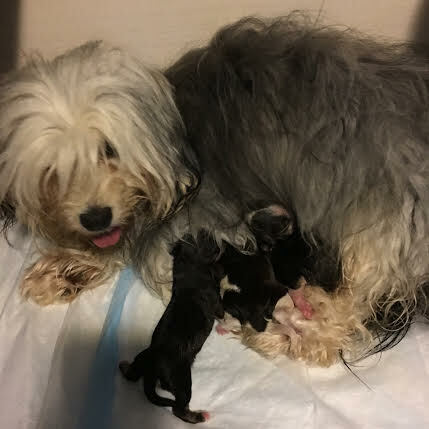 Knowing that we can contact you at any time with questions, concerns, and happy updates on the progress of our new puppy has made us feel as though we are part of your Havanese Family which has made us feel as special as our new baby Floki. Thank you so very much for bringing ultimate happiness to us through a healthy and happy puppy whom we cherish. I recently decided to get another havanese to give my three year old female havi a playmate. I carefully researched breeders andfound Dayspring Havanese. I couldn't be more happy with my experience. Dawn is amazing to work with. She truly cares for and loves her dogs. Dawn went above and beyond. She answered all of my many questions, andkept me updated with how my puppy was doing through phone calls, emails, pictures and videos. Every puppy "milestone" was captured from mama right after she had her litter, to their first steps, opening their eyes, playing, and their first meals! I was able to visit my puppy and meet the mom and dad. I now have the sweetest, most loving little boy puppy! I can't say enough wonderful things about Dayspring! This experience has been amazing and I have Dawn to thank! If you are considering a havanese, I strongly suggest you consider Dayspring Havanese! "From the first moment that I spoke with Dawn I felt a connection for the love we both have for this extraordinary breed. I also knew immediately that she was a very caring person. She is very passionate about the Havanese breed and also very knowledgeable about the breed. I just brought my Molly home this week she is 10 weeks old and I couldn't be happier with her. Dawn had a goody bag for us to take home with some supplies to get Molly started. She is beautiful, healthy and smart because of all Dawn's expert care. She is available for questions and concerns anytime day or night. She patiently explained everything to me regarding the food and all other supplies I would need. She kept me informed on my new puppy's progress and sent me pictures and videos. The Havanese puppy goes through very dramatic color changes throughout its life.